James Merlino at the Sodturn for the Olinda Precinct Plan in October 2018. Plans to revamp the former Olinda golf course will go ahead, following a hearing at VCAT. In a letter to the mail, jenny oxer, spokesperson of the hills common alliance said the group was left disappointed after it was agreed at a mediation session on 7 March that a parks victoria permit would not be challenged at an official VCAT hearing. 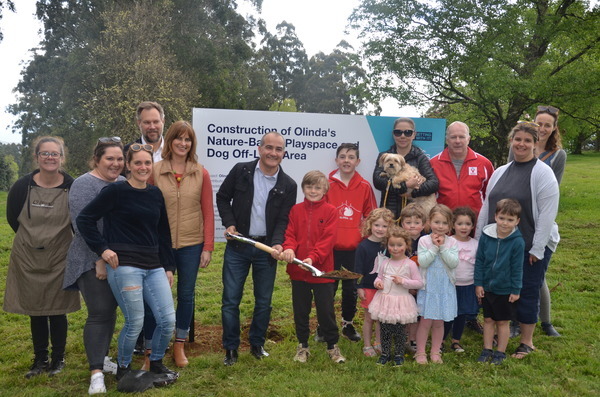 “At 5.35pm on Thursday 7, 2019, jenny oxer, co-ordinator for the hills common alliance signed documents at VCAT allowing the construction of the second Olinda football ground on the ex-Olinda golf course site,” she said. The decision means work to transform the 34-hectare site into public parklands that include a nature-based play space, a sports oval and open space for markets and events can now go ahead. The Olinda public golf course closed more than six years ago after being abandoned by its owners but in 2017 the Victorian government committed $4.72 million to revamp the 34-hectare zone, and in October 2019 Yarra Ranges Councillors approved the planning permit application. Ms Oxer said it was a disappointing outcome that would only benefit a small minority rather than the majority. “HCA believes it was worth taking our objection to the VCAT Conference level because we hoped it might be possible to move the project to a more appropriate site. Even though impinging upon a zone of Traditional Custodian Sensitivity, most in the community would have been very happy with a compromise,” Ms Oxer said. Next articleAssumptions are the mother of all problems.